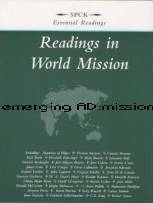 MISSION TO SLAVS: Readings in World Mission, page 11-12. The Nestorians worked as missionaries in China in the 6th century, talking, contextualising Jesus. Yet they were dismissed as heretics in the 2nd century. So this is mission for the edge to the edge. If you were forced from the church, would you put your energy into angry defense or pioneering mission? The emerging church is an edge movement. It seems we are increasingly dismissed as heretics. In response, where will we put our energy? Into protest and defense and anger? The Nestorians offer a fascinating approach. In the face of accusations of heresy, why not go wandering the edges of our world, offering God’s grace and love. No one, no matter how judgemental, can stop us doing that. Thank you for this post. I am sympathetic to the emerging church movement, especially in its concerns over traditional expressions of church in the West, and desires for missional incarnation in culture. I am also sympathetic to unfair criticisms and allegations of heresy, and I think this has taken place to some extent with the EC. However, while there is a place of EC practitioners to spend greater amounts of time in the positive development of their approach, they should also be open to sound criticism, and concerns for orthodoxy. While an obsession with boundary definition and maintenance is unhealthy, proper balance requires opennes to the wisdom of the church through the ages in her formulation of creedal definitions of the faith as a guard against heresy. Nestorianism was an important movement in the history of missions, and they made important contributions in contextualization in China. For that we take positive note. But we might also consider there problematic Christology, a watershed doctrine in the Christian faith. Perhaps we can find a balance between emphasis on cutting edge ministry, which also seeks continual dialogue with sound theology as well as missional praxis. appreciate the comment. this is a series of post in which I am simply trying to learn missiologically from global mission by reading a world mission text and applying it to EC. the post was a wondering aloud about a 3rd way for the EC; to neither ignore critique, nor to defend critique, but to seek ongoing missiological engagement. It would be fascinating to know in what ways the Nestorian visit to China perhaps re-shaped their Christology. Could the Spirit have been at work in that mission encounter, for the sake of indigenous culture and for the sake of the Nestorians? Could we dare to believe that if the EC continues in mission and in relationship, the Spirit might be gracious enough to deepen our theology? Sometimes I wonder if in fact all Christian expressions have some dimensions of heresy in them. If so, would we then get so paralysed by the need for right thinking that we forget right doing? I wonder if paralysis is overcome by a willingness to trust the Spirit, who surely cares more about pointing us to the Way, Truth, Life, than we do. I am not saying that the Spirit speaks outside human agencies and that human voices of critique should not be ignored. I do know that in the face of so much criticism, I tend to listen most to those who I feel are seeking genuine relationship with me, those who seem to care for me before they care for my ideas or my EC beliefs etc. Or is that a protection mechanism that needs to be deconstructed?